his graph illustrates the monthly temperature data for all sites on the Stour. 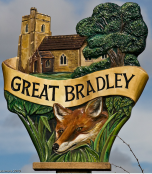 The recording from Great Bradley are in red. The coldest years were 1986 and 1991 and the hottest years were1994, 1995 and 2005. Records were available from 1981 to 2005, although the early period of the temperature record at the Great Bradley site has a significant amount of missing data. For the upper reach site (Great Bradley) temperatures appear to have remained steady from 1989 onwards. Figure 3.15 indicates that all the upper reach sites show a similar trend in winter except for the Stour site, which is likely to be affected by transfers from the Ouse catchment, and the Tyne site, which may be affected by Kielder reservoir. Both the Stour and Tyne sites show a slight downward temperature trend whereas all the other sites show an upward trend. The upper reach spring temperatures shown in Figure 3.17 again illustrate a general upward trend in water temperatures, although the Rivers Ribble and Stour show a slight downward trend. For more information download the report below.